Here's my review of what at this time was the largest of the remaining LEGO Legends of Chima sets for the season. Enjoy! Attack Sir Fangar’s Ice Fortress to reclaim the precious CHI! Worriz and Gorzan, with his fire CHI power vehicle, must battle their way into Sir Fangar’s Ice Fortress to reclaim the CHI. The Saber-tooth leader is forging weapons for the other awoken ice warriors in the weapons room, so they will need all of their skills to succeed. Move fast before the Saber-tooth warriors flip the bridge or activate the stairs trap. Evade shots from the ball shooter and avoid capture in the ice prison. Seek out Sir Fangar on his throne and grab the CHI! 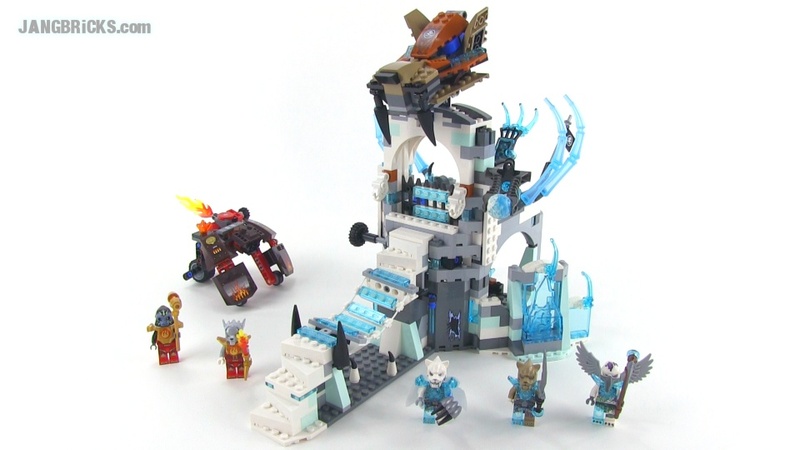 Transform the Saber-tooth head of the Ice Fortress into a cool flyer!